Maj. Gen. Scott D. Berrier, commanding general of the U.S. Army Intelligence Center of Excellence and Fort Huachuca, pins the Purple Heart Medal on Robert Ferrell for wounds received in action during the Vietnam War 47 years ago. Robert Ferrell, a native of Boston, and current resident of Nogales, Ariz., was injured Oct. 30, 1968, by shrapnel from a rocket-propelled grenade fire while serving as a “tunnel rat” during his assignment as a mechanized infantryman in Vietnam. Maj. Gen. Scott D. Berrier, commanding general of the U.S. Army Intelligence Center of Excellence and Fort Huachuca, presented the award on stage in Fitch Auditorium, Alvarado Hall, in front of Farrell’s wife, Lucy; son, Jesus, 15; along with Soldiers, veterans and community members, who gathered to honor the former Soldier. Farrell served in the Army from July 1967 to July 1969. He lived with the embedded shrapnel until it was surgically removed in 1973. Berrier presented the Purple Heart Medal after sharing a short history of the military decoration. The medal, the nation’s oldest military decoration, was originally conceived by President George Washington in 1782 and was originally called the Badge of Military Merit. Berrier recounted that Washington originally pinned the award on three Soldiers, who served in the Revolutionary War and were said to be sergeants in the Continental Army. Only three Badges of Military Merit were awarded. It was not issued again until it was reestablished as the Purple Heart Medal, Feb. 22, 1932, the 200th anniversary of Washington’s birth. 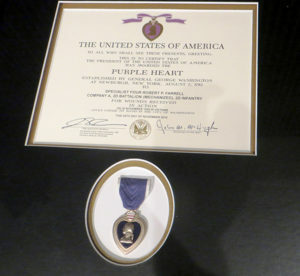 The Purple Heart is now awarded to any member of the armed forces of the United States who has been wounded or killed while in armed combat against an enemy force. “How appropriate is it that we are going to award the Purple Heart today to another sergeant from another war era,” said Berrier, citing that, overall, 1.7 million Purple Hearts have been given since its creation. 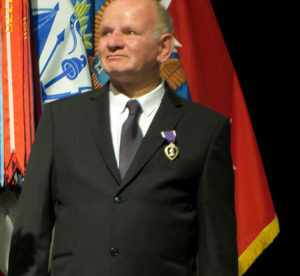 “The Purple Heart is given when you are wounded,” Berrier said. “It is an entitlement, and for Bob Farrell, that didn’t happen.” While Farrell was given an Army Commendation Medal for valor during the same combat situation, he never received the Purple Heart, Berrier added. The general took a few minutes to describe Farrell. As a young man, the former Soldier and avid fisherman grew up in Brookline, Massachusetts, as part of a strict Family, which included four brothers and two sisters. When he was 16, Farrell relocated to Tucson, Arizona. In 1967, to avoid the draft, Farrell enlisted in the military and was able to shave his military service to two years instead of four. Farrell enlisted as an 11 Bravo, an infantryman, and attended basic training on Fort Bliss, Texas, and attended advanced individual training on Fort Polk, Louisiana. Following training and after a month of leave, Farrell deployed to Vietnam. Robert Ferrell, currently of Nogales, Ariz., served as a “tunnel rat,” assigned to Company A, 2nd Battalion (Mechanized), 2nd Brigade, 1st Infantry Division, during Vietnam from July 1967 to July 1969. “Bob’s service in Vietnam was characterized by bravery and tenacity,” Berrier said. “You saw the photos of this young man on the wall [during a PowerPoint presentation before the ceremony] and you got the feeling he was a guy, who was in the game the whole time. “When he got to Vietnam, he was in the 1st Infantry Division, A Company, 2nd Battalion, 2nd Brigade. They operated in an area about 80 miles north of Saigon. … It was a combination of North Vietnamese regulars they were fighting and Vietnam insurgents. 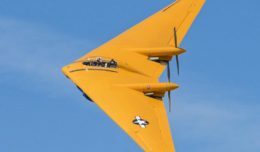 A lot of the techniques and tactics that Bob and his men perfected in Vietnam we used [later] in Iraq and Afghanistan,” Berrier said. “Bob volunteered as a ‘tunnel rat’ and on about 12 occasions during his year in Vietnam he took a .45 caliber pistol and a flashlight and he … went into the dark to search tunnels and find bad guys and pull out contraband and weapons. He did that very, very well. Berrier said that Farrell described how the other soldiers laughed at him because when his partner put a bandage on his head, he looked like the drummer in paintings of the Continental Army in which the young man went back into the battle and continued to fight the enemy to a successful conclusion of the battle. “And, so what we saw was a young man who was invincible, who was very brave, who did his job as a squad leader in the United States Army in that war. Today we’re going to pin him with a Purple Heart,” the general said, speaking of Farrell. Robert Ferrell’s framed Purple Heart Medal citation and medal is displayed on Fort Huachuca, Arizona, Dec. 3, 2015. 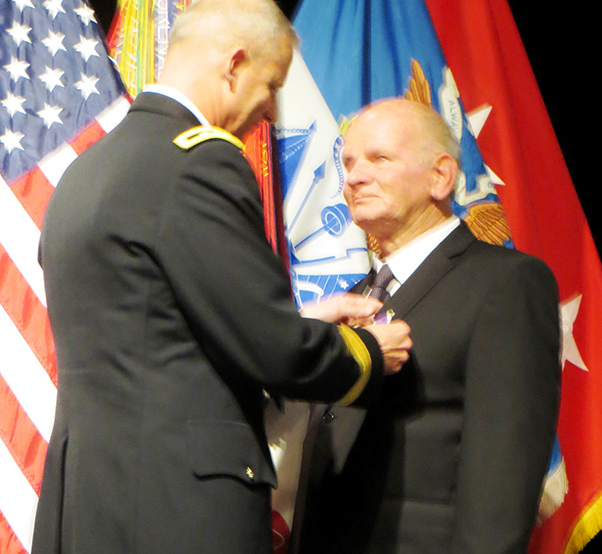 Following the reading of the citation, Farrell received his Purple Heart Medal, the accompanying citation and a certificate of recognition of his time in service during the Cold War.